This bull moose was photographed in Algonquin Provincial Park in Ontario, Canada. Early spring the moose are just growing their antlers and shedding winter coats, but I still think they are beautiful animals and could watch them all day long. There is only one highway going through the park, Rt. 60 in the southern part of the park. The rest of the park is accessible only via hiking, canoeing or kayaking, no motorized vehicles allowed. 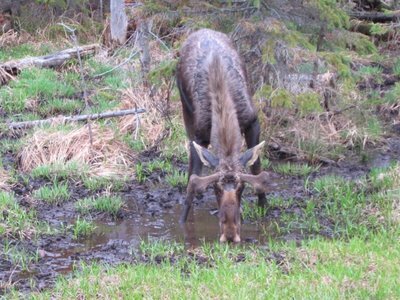 The moose are attracted to the salty vegetation growing along the highway from winter's salting of the road, so there's a good chance you'll see moose on a trip up there.